It is possible to obtain this armor set, as well as the reward from Thonar Silver-Blood. Run through the mine with Madanach until you get this equipment, then stall him while the other Forsworn escape the area. 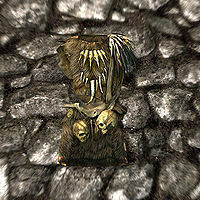 This will give you the opportunity to kill him, thus earning you the animosity of the surviving Forsworn prisoners, which they will express by attacking you once you leave. After defeating them, you can talk to Thonar, who will give you his family ring as a sign of his thanks. When wearing the full set of the Old Gods, the boots and gauntlets may disappear occasionally. May be a result of tempering the armor. This page was last modified on 29 November 2018, at 16:29.